In all honesty, I can't say that I had a truly happy childhood. When I was my daughter's age, all I remember was my father's death that resulted to my mother's financial struggles as a housewife, who was left with nothing. Our hardships caused our family's many heartaches. And personally, though it taught me resilience, I never learned how to save for the rainy days. Whenever someone gave me money then, I always spent it all at once. It's only now that I'm a mom myself that I am learning the ropes of budgeting, spending and saving. When Sophia received monetary gifts for her first birthday party and dedication, our original plan was to open a savings account for her. But then, Ondoy happened. Our purple rented house got flooded waist deep. Most of of our stuff got muddy and broken. Unfortunately, we needed to use her money to help us start anew. Fast forward to the many Christmases that she received thousands of money from her godparents; she has used it all up for her needs, which we should have given her. We never saved any, not even a single coin. I felt bad for those days that she had a lot. After all, at her age, she shouldn't be spending those gifts on her needs. We must provide it for her. So I'm grateful that the gods of coin banks heard my plea. Security Bank introduced Junior One Account to us. R and I were extremely delighted! You need to pay Php100 to open an account. If you want it to be named after your child, you need to submit a photocopy of her ID that has her photo and signature. You also need to present the original. Good thing we have her AFP military dependent's ID that has her super cute *signature*. Funnily, she wants to change it since it's really giving her a hard time. 'Cause you know, she wrote that when she just turned 5. Hehe. 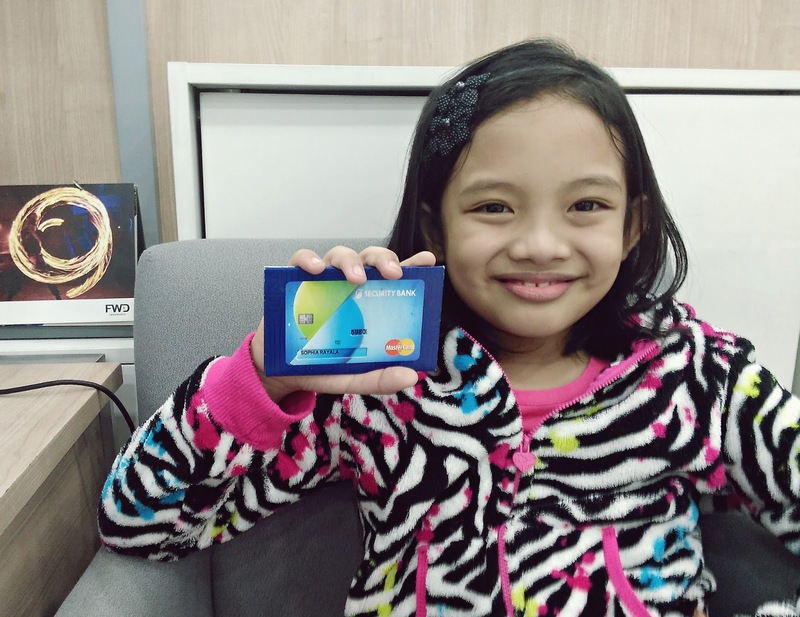 Your child will have the passbook the day she enrolled her account. After 7 banking days, she will also have a debit MasterCard. So nice, no? Their banks are open until 5PM. Really convenient for school-aged kids, I must say. Their bank associates are one of the nicest bunch ever. I think it's very important that the people working in banks have pleasing personality. After all, we're entrusting our money to them. Do you get what I mean? To date, Sophia has more savings than me. That is not actually a good thing, right? LOL. Well, we deposited the gifts she received from my mama and my SIL; including the dollars she got from my cousin. I saved a lot of coins in her dear ol' alkansya and I told her that we'll deposit it all in her account as my little gift for her at the end of the year. Come 2017, I'll teach her to save her loose change on her own, especially now that she gets a semi-regular allowance from me. Maybe I'll start giving her her daily P10-15 pesos extra money next school year aside from her packed food. How 'bout you, how do you teach your kid to save money? Sophia received a gift certificate from Security Bank but all thoughts and opinions are my own. When my son was only 2 years old, I have this mind-set na ayoko s'yang masanay with money at a very young age, but of course, there are times that his titas or grandparents would give him bills or coins. What I did is, I bought an alkansya for him. Everytime that somebody would give him money, I told him (my son), "Ihulog natin yan kay Baba ha?" (Baba - name of his alkansya, because it's a minion-shaped coin bank). I also opened a savings account for my son, but since he's still very young to sign up a form, I opened an account na ako muna yong maghohold and transfers it to his name when he gets 18 years old.